Onondaga Leader Oren Lyons, Pete Seeger on International Day of the World’s Indigenous Peoples | Democracy Now! Hundreds of Native Americans and their allies arrive in New York City today after paddling more than a hundred miles down the Hudson River to commemorate the 400th anniversary of the first treaty between Native Americans and the Europeans who traveled here. The event is part of the International Day of the World’s Indigenous Peoples, first proclaimed by the United Nations 20 years ago. We speak with Oren Lyons, faithkeeper of the Onondaga Nation who helped establish the United Nations Working Group on Indigenous Peoples in 1982. “We’re concerned about the future, we’re concerned about the Earth — seven generations hence — and the conduct of people,” Oren says. “We wonder, how do you instruct seven billion people as to the relationship to the Earth? Because unless they understand that, and relate the way they should be, the future is pretty dim for the human species.” We are also joined by one of their supporters, Pete Seeger, the legendary folk singer, banjo player, storyteller, and activist; and by Andy Mager, project coordinator for the Two Row Wampum Renewal Campaign and a member of Neighbors of the Onondaga Nation. 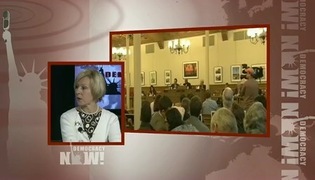 StoryNov 04, 2011Debate on Fracking: Was Syracuse Right to Ban the Controversial Natural Gas Drilling Process? AMY GOODMAN: Today marks the International Day of the World’s Indigenous Peoples. First proclaimed by the United Nations 20 years ago, the day focuses on indigenous people’s alliances, honoring treaties and respecting cultures. Events in New York kick off this morning when more than 200 Native and non-Natives are set to to arrive in New York after a two-week journey paddling in canoes down the Hudson River. They’ll be met by Dutch Consul General Rob de Vos, representatives of Native nations, and many supporters, before heading to the United Nations for a series of events. The canoers began their journey in Albany, the capital of New York, and paddled over 140 miles on a voyage to commemorate the first agreement between the early European Dutch settlers and the Haudenosaunee, the Iroquois Confederacy, known as the Two Row Wampum Treaty. This is Chief Jake Edwards of the Onondaga Nation explaining its significance. CHIEF JACK EDWARDS: In the Two Row Wampum, it’s stated, all the teachings that we shared from the Great Law of Peace, we shared with these newcomers to the forest. And so, in doing so, we also told them to be respectful of all and only take from Mother Earth as what you need to survive. And so this agreement came about. And what the Two Row represents is the Haudenosaunee people, Onkwehonwe, in their canoe, traveling down the river of life alongside the newcomers in their vessel, their ship. AMY GOODMAN: That was Chief Jake Edwards of the Onondaga Nation. Canoers who are part of the Two Row Wampum Renewal Campaign say environmental conservation is at the heart of the campaign. Many Native organizers are working closely with their neighbors at Onondaga Lake and along the Saint Lawrence River to protest fracking, the controversial method used to extract methane gas from shale. For more, we’re joined by three participants in the Two Row Wampum Renewal Campaign. Oren Lyons is with us, faithkeeper of the Onondaga Nation. He sits on the Onondaga Nation Council of Chiefs, also helped establish the United Nations Working Group on Indigenous Peoples in 1982. Andy Mager is with us, project coordinator for the Two Row Wampum Renewal Campaign and a member of Neighbors of the Onondaga Nation. And we’re joined by Pete Seeger, the legendary 94-year-old folk singer, banjo player, storyteller and activist. For over 60 years, he’s been an American icon, the author or co-author of so many songs, including “Where Have All the Flowers Gone?” “If I Had a Hammer,” “Turn! Turn! Turn!” Pete Seeger has also been a longtime supporter of Native American rights. We welcome you all to Democracy Now! Oren Lyons, let’s begin with you. What is the significance of this day? Why the paddling up the Hudson River to the United Nations today? OREN LYONS: Today we’re celebrating 400 years of association with our friends from across the great waters. Four hundred years ago, we met with the Dutch on the issues of trade, peace, friendship. And we agreed at that time that we would establish a relationship of peace and friendship for as long as the sun rises in the east, sets in the west, as long as the rivers run downhill, and as long as the grass is green. Grass is quite green today, and the rivers are running, and so is the sun rising. So here we are, 400 years. We’re going to have a 400-year-old handshake at—being met by the kingdom of the Netherlands, Attorney General de Vos and his wife, representing the counterparts of that original meeting, which is the grandfather, I would say, of all treaties made after that. This was the original agreement. AMY GOODMAN: Can you explain? We just watched Chief Jake Edwards holding the treaty, which is not words, it’s beads. OREN LYONS: Wampum and the belts and the strings that we’ve used over these many centuries was at that time the political currency of the time. That’s how things were agreed upon. That was our process. And over that past 300 or 400 years, it was used by everyone, all the Spanish, whether it’s English, whether it’s French—the peace and friendship and also what we call the Covenant Chain, to be polished again and again. The depiction of the two vessels side-by-side going down the river of life in peace and friendship, tied together with the Covenant Chain of peace—three links: peace, friendship and as long as the grass is green. So, we’re here celebrating the 400th anniversary of that. The past 400 years, of course, subject to all of this historic events of that time, and yet here we are. And yet, the issue remains, peace and friendship. And I think, from our perspective, we’re concerned about the future. We’re concerned about the Earth, seven generations hence, and the conduct of people. And so, we wonder, how do you instruct seven billion people as to the relationship to the Earth? Because unless they understand that and relate the way they should be, future is pretty dim for the human species. AMY GOODMAN: Pete Seeger, as Oren Lyons is speaking, you’re nodding your head “yes.” Why are you involved with the Two [Row] Wampum campaign? PETE SEEGER: I was fortunate to meet a man named Ray Fadden, who was a teacher on the Mohawk reservation near the Saint Lawrence River way back in 1950. And he taught me things. I was trying to run a little festival in the Adirondacks, and he came there with some of the students from his reservation. I remember asking him if he would teach me one of his songs. He said, “Pete, our songs are sacred to us, and you should not even try and sing them, except here’s a Seneca canoe song. I’d be glad if you learned that.” So, for 65 years, I guess, I’ve been singing the Seneca canoe song if I’m ever asked about Native American culture. AMY GOODMAN: Can you sing it now? PETE SEEGER: Ka iyo wa jin eh. Yo ho-oh. Ka iyo wa jin eh. Ka iyo wa jin eh. Eh! AMY GOODMAN: You have said that we should look not across the ocean for role models. PETE SEEGER: An extraordinary man—no one knows exactly how many hundreds of years ago—paddled out of Lake Ontario and went to a little village, the first village he came to, and said, “My name is Deganawida, but you can call me the peacemaker.” Well, the local war chief says, “Get out of here. That’s women’s talk. I am Tadodaho, the war chief.” So this young man went to another village, and there he met a man named Hiawatha, who was grieving for his wife and daughter who had died. Longfellow used his name, but Longfellow was actually telling a different story. But these two men now went from village to village to village and described a very interesting form of keeping the peace. These people, the Six Nations—the Senecas in the far west near Lake Ohio; the Canandaiguas, maybe 40 miles east; Cayugas, another 40 miles east—Lake Cayuga, that’s where Cornell is; the Onondagas, where Chief Oren Lyons is from; and the Tuscaroras and the Mohawks, some of them as far east near Vermont—and they started fighting with each other. And the system that this man, Deganawida, proposed was that the women, who were the heads of the clans—they know whose baby is whose—they appoint men who will meet once a year, and they’ll meet in the longhouse under a great tree of peace. And the white roots of peace will go east and west and north and south. And the eagle in the top of the tree would look for danger from afar. But they would discuss, instead of fighting, what were the things that people disagreed on. And it had an interesting rule: Nothing would be voted on unless it was slept on at least one night. I think that should be done more often. You don’t vote until you’ve slept on it at least one night. And at one time, Deganawida predicts an eclipse. He says, “Tomorrow, the afternoon, the sky will darken itself, as proof that we’re speaking the truth.” And it did darken itself. He must have watched exactly where the moon and the sun were rising and setting, and says, “They’re going to touch each other.” And, finally, this extraordinary system of government took place. Deganawida stuck around. Nobody knows exactly how long, whether it was half a year or two years. But he stayed to make sure that this system was working, and then he got into his canoe and paddled north into Lake Ontario, and nobody ever saw him again. But isn’t that interesting? I told the story more or less correctly, didn’t I? OREN LYONS: More or less. More or less. AMY GOODMAN: Andy Mager, this campaign that you have helped to organize, why are you involved, as a non-Native? And the significance of it, what you’re focusing on? ANDY MAGER: Well, the campaign is about justice. It’s about marking this 400th anniversary of the treaty that Oren talked about and calling on our people, on the people of the United States, the people of New York state, the non-native people of the world, to look at how we’ve behaved, how we haven’t honor this treaty. We haven’t abided by it. We have knocked the Haudenosaunee people out of their boat. We have sought to steer their boat. We have tried to control their way of life, in complete violation of this treaty. So it’s a call to us to look backwards, but to look backwards to look forward, to see how do we work together to re-establish peace and social justice, and in doing so, to preserve the environment. As Oren mentioned so eloquently, we’re in deep ecological crisis, and if we don’t shift our ways, the future for all of us looks very bleak. AMY GOODMAN: Between Pete Seeger and Oren Lyons, you’ve got 177 years. You’ve seen a lot of history with the American government and Native Americans. Oren Lyons, this is how the Haudenosaunee reportedly replied to the initial Dutch treaty proposal: quote, “You say [that] you are our Father and I am your Son. We say, 'We will not be like Father and Son, but like Brothers.' This wampum belt confirms our words. … Neither of us will make compulsory laws or interfere in the internal affairs of the other. Neither of us will try to steer the other’s vessel.” Can you talk more about the treaty and what you think happened to it, whether it was honored over 400 years, and the significance of the belt? OREN LYONS: Well, at this particular time, the Haudenosaunee, the Onondaga Nation, the Tonawanda Seneca and the Tuscarora Nation and the Cayuga Nation are probably the last independent governments still in charge of land and not under the processes of the Bureau of Indian Affairs in Washington, D.C., or the Department of Indian Affairs in Canada. We still raise our leaders as we did before, by consensus and by agreement and by, first of all, having the women choose the leaders. The women have a great deal of responsibility in this process, in that they not only choose the leaders, but the leaders have to be agreed upon by consensus by the family. And until she finds that leader that finds that consensus, then they will agree to raise that leader. And then the Council of Chiefs will also have that right of consensus. If they don’t agree, she has to go back again. And finally, it goes to the council. The Grand Council itself, Six Nations, will challenge that, as well. So, this leader is going to be vetted many, many times. And clearly, she has to make a good choice. She also has the power of recall, and she can remove that title for malfeasance of office, for violations against women or children, or any kind of violation that the—the structure of the league is very old, and it’s a continuum and probably is the original democracy that so inspired Ben Franklin and the Continental Congress to follow our lead. And we were in discussion with them many, many years and closely associated with their development. AMY GOODMAN: Could you—yes, Pete Seeger? PETE SEEGER: This is an extraordinary thing. Twenty-three years after Benjamin Franklin received a letter describing this method of government, the Constitutional Convention for the United States was about to break up. The Jeffersonians didn’t want to talk to the Hamiltonians, the North and the South, and so on. And Franklin holds up this piece of paper, saying, “These are people we call savages because their ways are different from ours, but they have kept the peace for hundreds of years. And if they can, why can’t 13 English colonies?” And he shamed the Constitutional Convention to keep on talking and find compromises that they could make a constitution. OREN LYONS: Yeah, it is the foundation of this United States. AMY GOODMAN: Can you talk about the significance of the headdress you have in front of you? OREN LYONS: Well, I talked about the eagle on top of the tree of peace. That’s this feather. The eagle represents a spiritual leadership of the animal world for the birds and the leader of the birds, and all animals have leaders. The deer is the leader of all the animals for four legs. And so, the feathers of this powerful entity, who carries our words the highest of any bird, flies the highest and carries our words the closest to the creator. And it is our principal messenger of peace. And so, we revere these feathers, and we revere this representation of our—of the bird nations. And we carry it close to us. And our staffs are always with these great birds’ feathers that remind us of our responsibility. AMY GOODMAN: Andy, can you talk about the horseback ride today? ANDY MAGER: Sure. The Dakota Unity Riders, who have come from Manitoba, Canada, traveling over 4,000 miles, though not continuously on horseback that journey, have sort of joined with the Two Row campaign. They started as independent initiatives, and we realized that there was much in common, so they have joined us in Troy, New York, before we started paddling down the Hudson, in Catskill, in Beacon, and we expect them to be joining with us at some point today, although there were problems with the permit. There will be a march today after our paddlers—our paddlers are on the water today now in their final journey into Pier 96 in Manhattan. They’ll land there. We’ll have a welcoming from the Dutch consul general, from our congressman based in central New York, Dan Maffei, and others. Then we’ll march across Manhattan to the United Nations, where we’ll be welcomed by the U.N. Permanent Forum on Indigenous Issues. Somehow in that process, the Unity Riders will join us. The NYPD would not give a permit, at least the last I had heard, for them to walk beside our march, so there’s a little bit still up in the air about that. But there’s very much a shared sense of unity, of renewal, of call for respect for Native rights at the core of both campaigns, and we’re delighted to work with them. AMY GOODMAN: How does fracking fit in with this story, Oren Lyons? ANDY MAGER: Water—water is the first law of life. And looking through the generations ahead of us and protecting their future and being responsible to that, fracking, of course, impacts water amazingly—millions and millions of gallons of fresh water being used and absolutely contaminated beyond any point of redemption. And so, it’s an attack. It’s an attack on the future lives of our children and everybody else’s children, as well, and life, in general. The laws of nature are such that you will suffer in direct ratio, in direct ratio to your transgressions. Simple as that. And there’s no—and people should understand this. There is no mercy in nature, none whatsoever, only the law, only the rules. And if you follow those laws and rules, you have regeneration again and again. And if you want to challenge those laws, then you suffer the consequence. And that’s where we are right now. We are—so, fracking is probably the most damaging challenge that America has today in terms of its future. AMY GOODMAN: Pete Seeger, would you like to weigh in on fracking? PETE SEEGER: That’s absolutely true. It’s incredible that people say, “Oh, I need a job. I’ll work for the fracking.” But to get a little gas to run cars or factories, we’ll destroy the future for our children and our grandchildren. Horrifying. AMY GOODMAN: Oren Lyons and Andy Mager, I want to thank you for being with us. Oren Lyons, faithkeeper of the Onondaga Nation. Andy Mager, one of the organizers of the Two Row Wampum Renewal Campaign. We’re going to go to break, and when we come back, I want to speak a few more minutes to Pete Seeger, and then we’re going to combine together for a post-show conversation, which we’ll post online at democracynow.org. Stay with us on this Indigenous People’s Day.